Japanese high school student wearing an optical illusion print dress with platform boots, pink hair, a rainbow backpack, and custom nail art. 17-year-old students wearing eye-catching outfits from Gallerie, UNIF, Puma, and O.C Crew in Harajuku. Japanese student’s rainy day Harajuku street style with a wolf dress, leopard print platform booties, and fishnets. 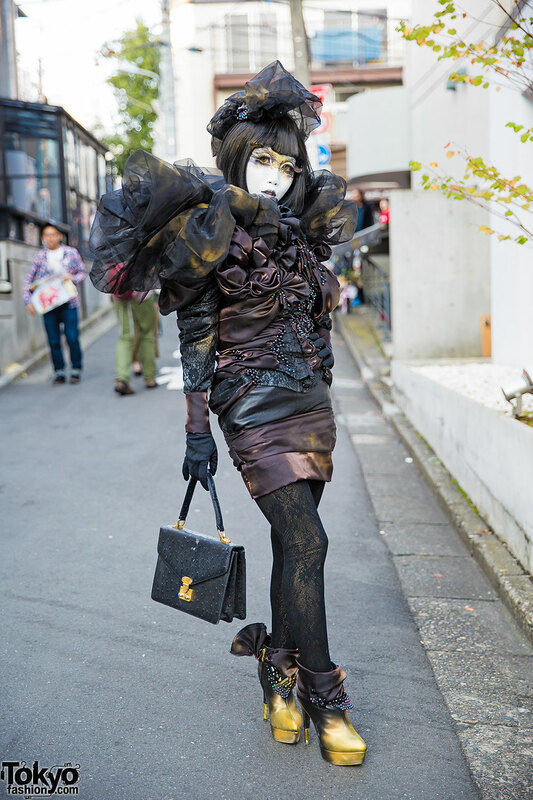 Minori in shironuri makeup and dark colored handmade outfit with mini dress, headpiece, vintage purse & remake boots. Harajuku girl in front-lace denim mini dress, white mesh backpack, and Tokyo Bopper platform ballerina shoes. Harajuku girl with twin tails wearing a monochrome mini dress with holographic backpack, socks and sandals, choker and nail art.